So I'm in Crieff, 18 miles outside of Perth, at 2pm and my plans to attend St Johnstone v Aberdeen at McDiarmid have been scuppered thanks to a waterlogged pitch. Step # 1: Find the nearest possible league game and do my damnedest to get there. Step #2: Put my full faith in a long time friend and his Peugeot 307 which he had earlier described as "not a great car". Check: Some powerful driving and we arrived missing only 90 seconds of the kick off and most likely breaking a number of speed limits along the way. The rushed nature of the arrival meant that we sadly didn't get to soak up any of the pre-match atmosphere and after paying a hefty £19 we took our seats in the Bill Shankly Stand - in with the away support who were both large in number and life. Looking around, I was reminded of the strange little ground that is Dens Park. "Six pence in the pound, Six pence in the pound....you tinky b*stards....six pence in the pound"
I also witnessed one of the most impressive off-pitch feats (or should I say eats!) at a football ground when a Raith fan, maybe around 17 years of age, managed to put away 2 hot dogs, a pie and a burger in the space of 90 mins, even finding time to cleanse his palate with a packet of fruit pastilles. Clearly a snake in a human costume. In terms of match action, from minute one until minute 84, Raith were simply dominant. They used the wide men of Dyer and McBride very well, with big Gregory Tade up front causing a number of problems for the home defence. Rovers were especially dangerous from set pieces with captain Grant Murray going close on two occasions with headers from corners. Unsurprisingly, this is where the breakthrough came from when on 51 mins he made it third time lucky sticking away a header from 10 yards. Dundee on the other hand were fairly hapless. Physically strong but technically void. Extremely direct to the point of being a bit Wimbledon-esque. The epitome of this style was Dundee's big bruiser of a centre half, Craig McKeown, who spent the entire 90 mins illegally battering (and getting away with it) the Raith forwards and "hoofing" it straight up the park with no finesse whatsoever. Feel free to praise me for my opportunistism in filming this clip! 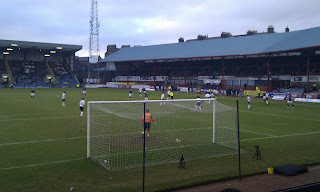 12 more minutes, including six minutes of injury time were played after this went in and with the last kick of the game, Neil McCann (of Hearts, Rangers and SKY TV fame) took advantage of another panic in the Raith defence caused by a long ball to hook the ball into the top corner for an unlikely 2-1 win for the Dees. Overall, a really enjoyable game full of high drama. The last 10 minutes alone were well worth the entry money. 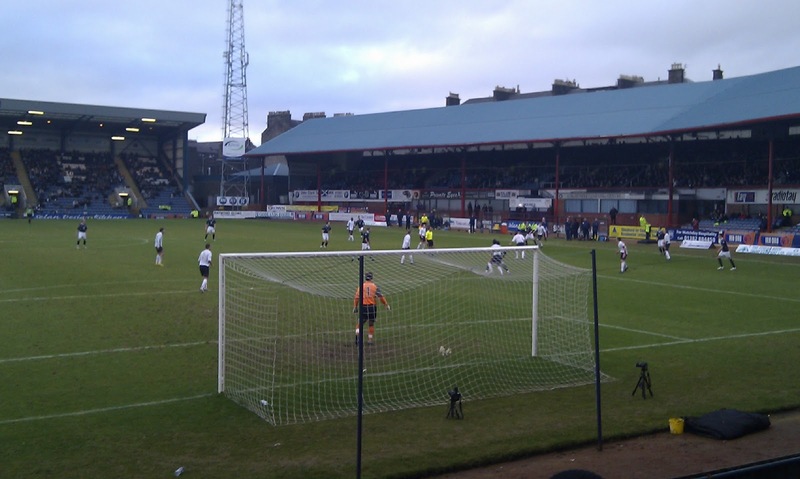 Dundee - could not have been more of a textbook Scottish team. Big, strong, technically not great but full of bruisers and also capable of occasional moments of genius (hence two goals). 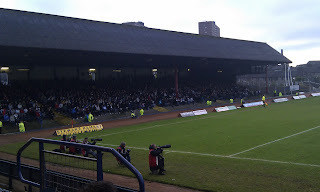 Raith - a good side, but my feeling is that they would struggle in the SPL. On this evidence they seem simply unable to close a game out, should've been 3-0 up and were punished accordingly. Finance can't even really be used as a rationale - the £19 paid to get into Dens is what you'd expect to get into most SPL grounds. So the question is, are Dundee and Raith simply bigger clubs than Hamilton & St Mirren or is the ill that is allegedly afflicting the whole Scottish game, actually just a problem for those at bottom end of the Scottish Premier League? Star Man: Stephen Simmons (Raith) - kept things ticking over. Touch of class. Time for the judge's scores. Recommendation: Great game. Up and at 'em, exciting Division One tie....on this occasion. I do fear that the home side could put on some absolute horror shows as well though. Maybe not first choice in a full calendar, but if you're near Dundee & they're playing, drop in. It's a 206, not a 307, and I NEVER break speed limits! Kicking myself that I stopped filming right before McCann took his shot.